Just like an NFL team, dynasty owners need to evaluate their team every year and set themselves up for sustained, long-term success. As a dynasty league commissioner and league champion, I would like to offer my suggestions on how to build each position group. My recommendations will be based mainly on the roster structure of my own leagues, but I will also offer some more general comments. My main league that I run is a 10 team, 0.5 PPR, dynasty IDP league that has 35 roster spots and 2 reserve spots. We start 1 QB, 2 RB, 3 WR, 1 TE, 1 R/W/T flex, 1 K, 1 DL, 1 LB, and 1 DB. After a 12-1 championship season in the first year of this league, the loss of David Johnson hurt me in 2017. Still, I’m very happy with this team and it fits my format below fairly well, but obviously I am a bit biased. I’ll have the first pick in each round this season, but no picks in the first two rounds. My second team that I recently took over this past week is in a 12 team dynasty league with 32 roster spots but 25 max keepers and 3 reserve spots. We start 1 QB, 2 RB, 3 WR, 1 TE, 1 R/W/T flex, 1 K, and 1 DEF. I still have some work to do to make that team look the way I’d like it to. I’ll have the 12th pick in each round of this year’s draft. For each position, you want to have as many top players as possible, obviously. However, this is not usually feasible. A more attainable goal is to have one top-X player at each position, X being the number of teams in your league. For example, since my main league has 10 teams, I would like to get at least one top-10 player at each position. From there, you want to have a player(s) to fill each category I will lay out below. Keep in mind some players may cover multiple categories and give you a little more freedom. Depending on the size of your roster, I recommend having at least two (2) quarterbacks, and no more than four (4). You want to have youth wherever possible. Players I own are highlighted in red, blue, or purple (both), depending on the league. At the quarterback position, having a top-caliber, high-floor, high-ceiling guy that’s able to score 15+ points per week consistently is very valuable. In 2017, the top 10 scoring quarterbacks were: Russell Wilson (SEA), Cam Newton (CAR), Alex Smith (KC, now WAS), Tom Brady (NE), Carson Wentz (PHI), Kirk Cousins (WAS, now free agent), Philip Rivers (LAC), Matthew Stafford (DET), Drew Brees (NO, now free agent), and Ben Roethlisberger (PIT). Perennial top-10 quarterback Aaron Rodgers (GB) only played in 7 games in 2017 due to injury, and 2016 NFL MVP Matt Ryan (ATL) still made the top 15 last season. These players produce in a variety of ways, whether it be throwing for 300+ yards and multiple scores each game, or using their legs as true dual-threat players. In real-world terms, this is what we would call your “franchise quarterback”. 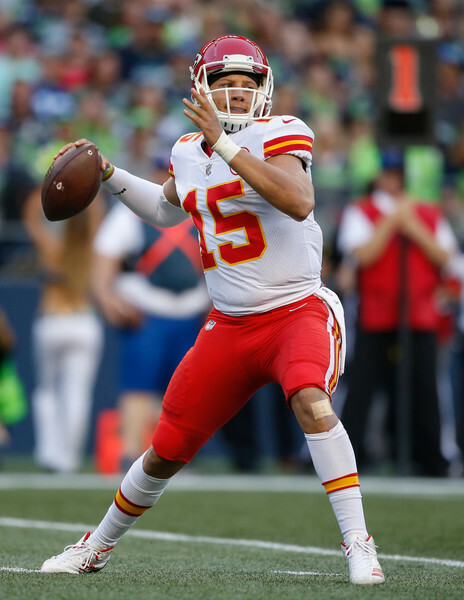 This is a player who is young (under age 28) and has shown solid development and potential as a starting quarterback in the NFL. Carson Wentz falls into this category, as well as being a top-10 starter from 2017. Other members of this category include Jared Goff (LAR), Dak Prescott (DAL), Marcus Mariota (TEN), Blake Bortles (JAX), Derek Carr (OAK), Jimmy Garoppolo (SF), and Jameis Winston (TB). These players may have their ups and downs, but they will be the ones to take over as the aging veterans start to show declines in production or retire. Andrew Luck (IND) is another player to watch, but with his injury history and the fact he will be 29 when the season starts, he may not be worth the investment. If the 2017 quarterback class wasn’t discussed enough, the 2018 class has surely made up for it. Without knowing yet where they will land, this years prospects certainly have the potential to be very good. The top 5 (Josh Rosen, Sam Darnold, Josh Allen, Baker Mayfield, and Lamar Jackson) could all have starting jobs within the next three seasons, and some will be given a chance from day 1. If your roster allows for it, take a chance on one of them and see what happens. If you’re not quite ready for that, Deshaun Watson (HOU), Mitchell Trubisky (CHI) and Patrick Mahomes II (KC) will both have starting roles in 2018 and they are all still in their early 20’s. If you still haven’t acquired the number of quarterbacks you desire, there are still a few players to look for in the event that your starter is injured. Although they are older and their production may be mediocre, players like Joe Flacco (BAL), Andy Dalton (CIN), and Eli Manning (NYG), and Tyrod Taylor (BUF, now CLE) should be available or cheap to get. Depending on how free agency and trades shakes out, Sam Bradford, Case Keenum, Josh McCown and Nick Foles could all make it into this category as well. Depending on the size of the roster, I recommend having at least six (6) running backs. You want to have plenty of depth because injuries are common. You also want to have youth wherever possible. Players I own are highlighted in red, blue, or purple (both), depending on the league. Just like with quarterbacks, having a top “bell cow” running back to plug into your lineup regardless of matchup will help your fantasy team and reduce the stress of over thinking who to start. Players who have prominent roles in both the running game and passing game consistent because they aren’t as affected by game script. If your league awards points per reception (PPR), three-down backs are even more valuable. Last year’s top 10 scoring running backs were: Todd Gurley (LAR), Le’Veon Bell (PIT), Alvin Kamara (NO), Kareem Hunt (KC), Melvin Gordon (LAC), Mark Ingram (NO), LeSean McCoy (BUF), Leonard Fournette (JAX), Dion Lewis (NE, now free agent), and Carlos Hyde (SF, now free agent). 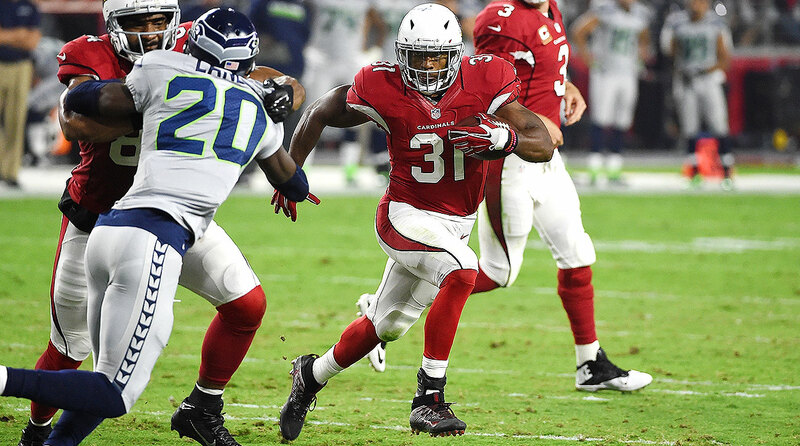 David Johnson (ARI), who had over 2000 scrimmage yards and 20 total touchdowns in 2016 missed the majority of the 2017 season with a wrist injury. Overall, these top backs are able to receive a large majority of their teams running back touches and should be able to score 8-12 points each week. Any more than that is just a nice bonus to make up for any players who don’t perform well in a given week. Ideally, you would like to have another running back to play in your second spot also ranked in the top-X range, but if this is the case, you are usually deficient at another position or were fortunate with your acquisitions and draft in recent years. If you are in a 10 team league, a more realistic goal is to have your second running back fall in the top 20 scorers. Quickly, the next 10 scorers at RB in 2017 were: Christian McCaffrey (CAR), 2016 leading rusher Ezekiel Elliott (DAL), who missed time in 2017 due to suspension, Jordan Howard (CHI), Duke Johnson (CLE), Devonta Freeman (ATL), Lamar Miller (HOU), Jerick McKinnon (MIN, now free agent), Alex Collins (BAL), Frank Gore (IND, now free agent), and C.J. Anderson (DEN). Even if you have #1 and #20, their combined production each week should keep you competitive at the running back position. If you can add a few more from the top 30, it certainly won’t hurt. 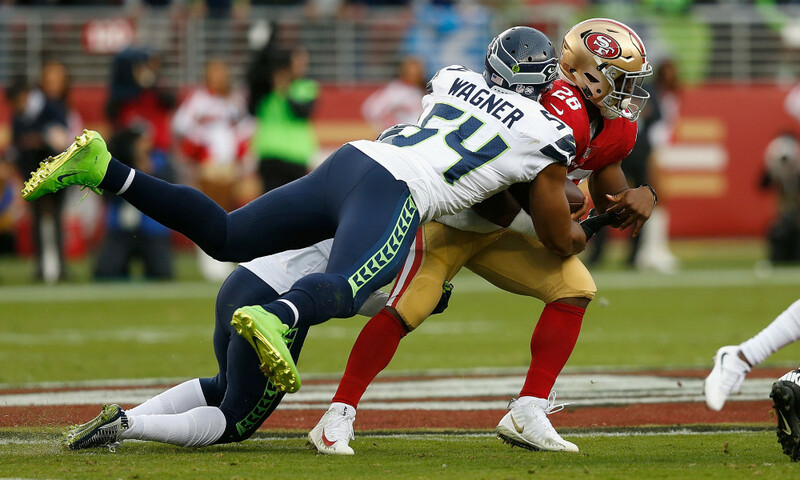 When you are building depth, you want running backs that will be able to contribute to your team, whether it be in the flex slot or the running back slot during a bye week or should your regular starter suffer an injury. These players have usually been in the league 3-4 years and have climbed up to the top one or two spots on their team’s depth chart. They may also be playing at a high enough level that the starter ahead of them may be released in the near future, which would give them an increased role. With the Titans releasing DeMarco Murray, third year former Heisman trophy winner Derrick Henry will assume the starting role, and will only be 24 at the start of the season. Besides some of the backs that have made into the other categories above, other young backs to consider are Jay Ajayi (PHI), Isaiah Crowell (CLE), Tevin Coleman (ATL), Ameer Abdullah (DET), Giovani Bernard (CIN), Kenyan Drake (MIA), Javorius Allen (BAL), and T.J. Yeldon (JAX). The last two years have been great for running backs taken early in the draft. Elliott, Howard, Kamara, Hunt, Fournette, and McCaffrey have all been able to make an immediate impact. Others may be primed to breakout this year, including Joe Mixon (CIN), Dalvin Cook (MIN), Elijah McGuire (NYJ), Marlon Mack (IND), Wayne Gallman (NYG), Aaron Jones/Jamaal Williams (GB), Samaje Perine (WAS), and Peyton Barber (TB). The 2018 class is led by Penn State’s Saquon Barkley, but has quite a few running backs that could find success early. Although these players may not end up in or currently be in the best situations, and may not be producing at as high of a level as others, you have to remember this is a dynasty league, and you’re here for the long run. Pay attention to free agency and retirements. Suddenly the guys that you took a chance on will (hopefully) be creeping up the depth chart. The notion and value of the “handcuff” running back is debated in the fantasy community. For teams that have a star running back, their replacement will not be found in one person. Take David Johnson for example in 2017. The Cardinals acquired Adrian Peterson, but they still used four other backs to help fill the void left in their backfield. There is no sense in really owning any of these guys unless one of them truly emerges a favorite. There are only a few players not previously mentioned that I would personally consider owning if I had the starter in front of them as well: Latavius Murray (MIN), Chris Ivory (BUF), LeGarrette Blount (PHI), and Tarik Cohen (CHI). One last note, just based on my personal biases: stay away from the Seahawks backfield altogether. SAME AS RUNNING BACK. Depending on the size of the roster, I recommend having at least six (6) wide receivers. You want to have plenty of depth because injuries are common. You also want to have youth wherever possible. There are certain players that become better fantasy options in PPR leagues, so know your league settings. Players I own are highlighted in red, blue, or purple (both), depending on the league. Every quarterback has their go-to receiver. 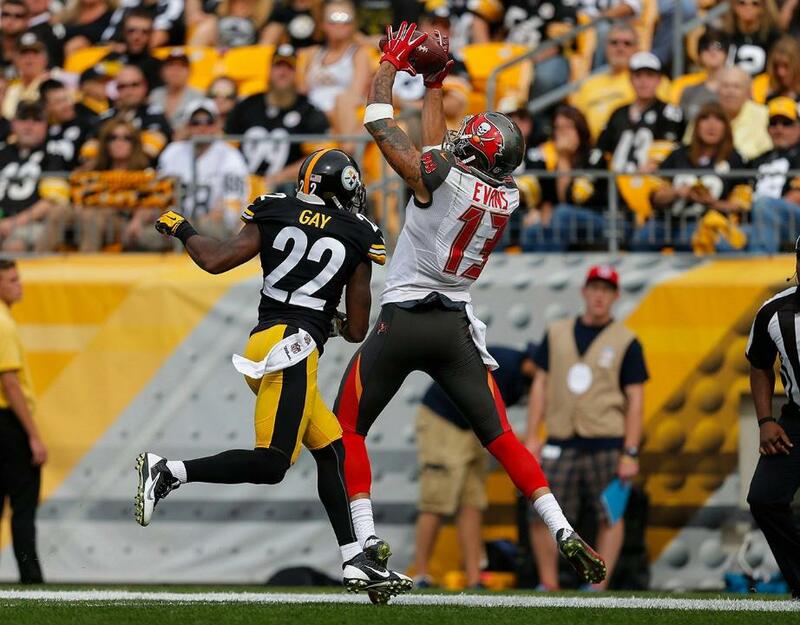 Being a go-to receiver leads to more targets, which usually leads to more fantasy points. Each of the top 10 receivers from 2017 led their respective teams in receiving, and half of them had over 100 receptions, which is phenomenal for PPR leagues. In order, they were: DeAndre Hopkins (HOU), Antonio Brown (PIT), Keenan Allen (LAC), Tyreek Hill (KC), Jarvis Landry (MIA, now CLE), Michael Thomas (NO), Julio Jones (ATL), Larry Fitzgerald (ARI), Adam Thielen (MIN), and Marvin Jones (DET). For as many opportunities as there are in today’s pass-heavy NFL, it certainly pays to have No. 1 guys like these to put into your lineup each and every week. Similar to running back, you want to have your next two or three wide receivers be solid WR1 or WR2 options. Some teams may even be able to support three fantasy-relevant receivers. Because there are so many receivers in the league, players in this range may extend all the way to the top 50 receivers in your league. There are still 22 teams with a go-to option that didn’t happen to make the top 10 above, and at least half the all teams have a clear No. 2 option that is worth having on your team. A.J. Green (CIN), Brandin Cooks (NE), Doug Baldwin (SEA), Davante Adams (GB), Mike Evans (TB), Alshon Jeffrey (PHI), Amari Cooper (OAK), T.Y. Hilton (IND), Allen Robsinson (JAX, now CHI). I won’t name them all. Another word of advice: While you can certainly have them on your team as a sort of “handcuff”, I wouldn’t recommend starting two receivers from the same team, as they are unlikely to both produce consistently, unless their quarterback is averaging 400 yards per game. Young receivers are not always given the opportunity to start right away. They may be factored into four-wide sets, but otherwise may only see the field during the week at practice. Sooner or later though, guys will earn more playing time and find themselves moving up to that third spot on a team’s WR depth chart. Sometimes this transition period can take a few years. Be on the lookout for statistical trends that may be indicative of this transition and buy these receivers while their price is still low. Chemistry development between quarterback and receiver is another important factor, especially is you want to receive even a glance from Aaron Rodgers (GB). Other players that may be worth taking a flyer on are those who join new teams and assume a starting role. New system, new teammates, and new opportunities may lead to fantasy success that hadn’t been seen before, like in the case of Jermaine Kearse following his move from the Seahawks to the Jets. Pairing Sammy Watkins (LAR, now KC) with the arm of Mahomes may bring him his best season yet. Fill the rest of your WR bench slots with young sophomores and rookies with potential that may even start out as a WR3 or higher. Last year, JuJu Smith-Schuster (PIT), Cooper Kupp (LAR), Keelan Cole (JAX), Chris Godwin (TB), and Kenny Golladay (DET) were able to make significant contributions. Top 2017 prospects Corey Davis (TEN) and Mike Williams (LAC) dealt with injuries for most of the season, but will look to breakout this year. The 2018 class, including Calvin Ridley (Alabama), Courtland Sutton (SMU), D.J. Moore (Maryland), Christian Kirk (Texas A&M) and others, will be looking to be drafted early and earn their place on the field for Week 1 as well. Depending on the size of the roster, I recommend having at least two (2) tight ends, and no more than four (4). You want to have youth wherever possible. Players I own are highlighted in red, blue, or purple (both), depending on the league. After the top tier of tight ends, the position drops off in terms of consistent production. While you only need to start one tight end and it won’t be the biggest loss if you can’t get one of the big names, having Rob Gronkowski (NE), Travis Kelce (KC), or Zach Ertz (PHI) is a plus. The rest of the top 10 consists of Evan Engram (NYG), Jimmy Graham (SEA, now free agent), Delanie Walker (TEN), Kyle Rudolph (MIN), Jack Doyle (IND), Cameron Brate (TB), and Jason Witten (DAL). Because teams in the NFL have either gone to using multiple tight ends or hardly using a tight end at all, consistent options are hard to come by. After your starter, you just need someone to be able to fill in in case of injury and on bye week. Jordan Reed (WAS) and Greg Olsen (CAR) are great options, if they can stay healthy. Try to get someone in the top 20 range. Tight end is a position that some even consider streaming, which I would not be opposed to if you’re without a top-X starter. Tight end is one position where it is commonly known that rookies rarely find success. However, if you hold on long enough, you might strike gold. The best example is Hunter Henry (LAC), who has consistently cut into the snap count of future Hall of Famer Antonio Gates over the past two seasons and may finally force him into retirement with a solid 2018 season. 2017 and 2018 both have been noted as having some of the best tight end prospects in recent memory, so find a guy you like and hold on to him for a while. 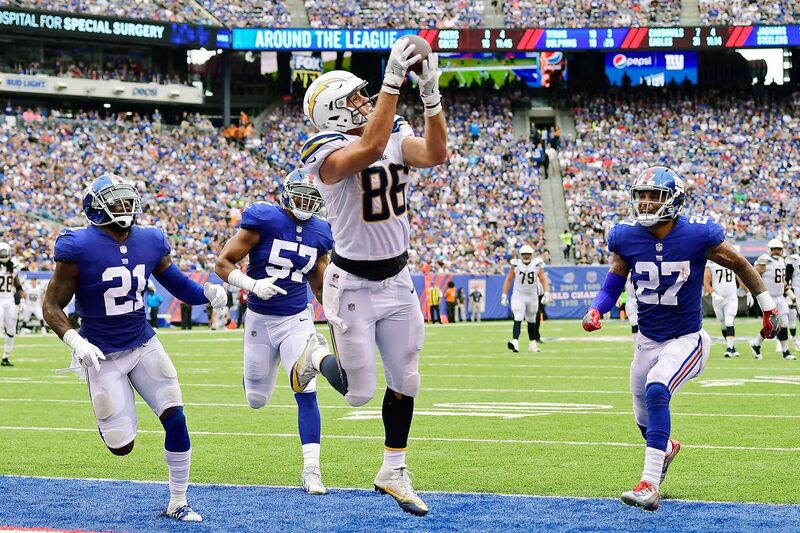 Look for other teams that use their tight ends frequently and have aging starters that will need a youthful replacement in the near future, like Dallas, Baltimore, and Tennessee. Depending on the size of the roster, you really only need one (1) kicker, and there will always be someone available as a bye week fill in. Players I own are highlighted in red, blue, or purple (both), depending on the league. I’m not going to spend much time here. 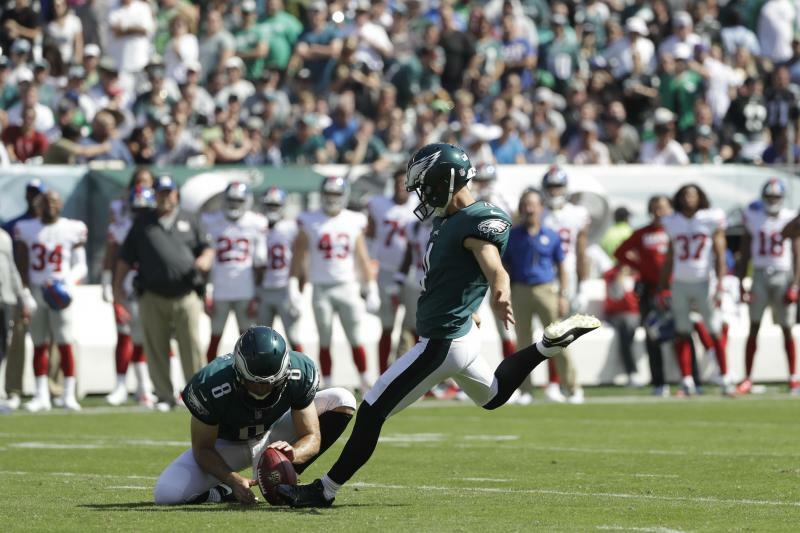 Find a kicker on a team with an offense that will score touchdowns and get into field goal range consistently each week. Don’t waste time streaming kickers each week, just find a guy and stick with him unless he really isn’t producing. If you find a good one, let the Chargers know where to find him. After his 61-yard game winner in week 3, I picked up rookie Jake Elliott (PHI) and haven’t looked back. This is for traditional, non-IDP leagues. Keep scrolling for IDP leagues. Depending on the size of the roster, you really only need one defense, but having a second defense with a different bye week than your main team will avoid having to “stream” defenses. Teams I own are highlighted in blue. 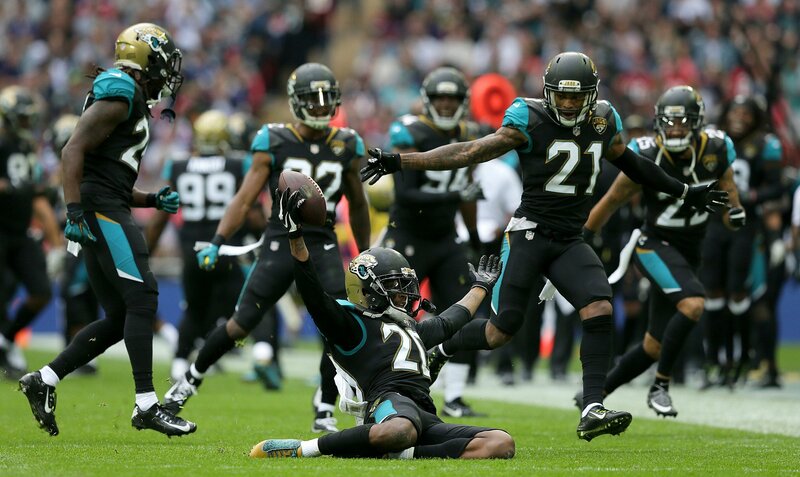 In 2017, the Jaguars were the defense to own, and with their youth, they seem to be the team to own going forward as well. Defenses can vary greatly, but if you can find a team that can consistently force turnovers, get after the quarterback, and keep opposing offenses from scoring more than 17 PPG, keep them. I own the Vikings who fit this description pretty well. I also own the 49ers, who are one of the teams on the rise heading into 2018, especially with their recent addition of Richard Sherman. One of the most popular positions to “stream” is team defense. Based on the matchup each week, you can acquire and start a team likely to score more points against of lower quality opponent. However, if your league has a waiver budget or transaction counts, this can be a risky method. I’m personally not a fan of streaming defenses, but I have done it when necessary and plenty of people have success doing it. In addition to reading the information below, also check out my article Keys to IDP Success: OPPORTUNITY. This is for IDP leagues. Team defense (DEF) is above. Depending on the size of the roster and how many IDPs you start, you want at least enough starters at one backup at each position. You do not want to hold onto too many IDP players because there are so many and quite a bit of variability. Players I own are highlighted in red. For the defensive line position, the majority of the top scorers are defensive ends that rack up points on sacks and tackles for loss, rather than interior lineman. Most are young and given the opportunity to play 75% or more of their team’s defensive snaps. From top to bottom, the top 10 from 2017 were Cameron Jordan (NO), Calais Campbell (JAX), Khalil Mack (OAK), Joey Bosa (LAC), Demarcus Lawrence (DAL), Jadeveon Clowney (HOU), Melvin Ingram (LAC), Jason Pierre-Paul (NYG), Cameron Heyward (PIT), and Yannick Ngakoue (JAX). You don’t want to reach too much for IDP in drafts, but I would still recommend grabbing a top guy before they are all gone. Due to the variability of IDP scoring settings, top scorers can vary, so I won’t list the next tier, but as with offensive positions, you want your next defensive lineman to be a solid player capable of stepping and producing in for you rather than just a random pickup at the last minute. Look at their stats and look for consistent production, not huge weeks followed by goose eggs. I chose to make IDP a priority and fortunately own two of the top 10 players, so I am not concerned here heading into 2018. As I mentioned, the top scorers are usually young defensive ends that have the motor to keep them on the field and give them more opportunity to make plays. Look for top picks from recent drafts like Myles Garrett (CLE) or the upcoming draft like Bradley Chubb (N.C. State) to keep on your bench until they enter the top tier themselves. This is for IDP leagues. Team defense (DEF) is above. Depending on the size of the roster and how many IDPs you start, you want at least enough starters at one backup at each position. If you have IDP flex slots, linebackers are typically the most consistent, highest scoring defensive players. You do not want to hold onto too many IDP players because there are so many and quite a bit of variability. Players I own are highlighted in red. For the linebacker position, the majority of the top scorers are 4-3 middle linebackers who pile up tackles working sideline to sideline, as well as a few high-profile pass rushers that can score in the same ways as the top defensive ends. On average, they play 95%of their team’s defensive snaps. From top to bottom, the top 10 from 2017 were C.J. Mosley (BAL), Bobby Wagner (SEA), Blake Martinez (GB), Demario Davis (NYJ), Deion Jones (ATL), Joe Schobert (CLE), Wesley Woodyard (TEN), Christian Kirksey (CLE), Luke Kuechly (CAR), and Telvin Smith (JAX). You don’t want to reach too much for IDP in drafts, but I would still recommend grabbing a top guy before they are all gone. 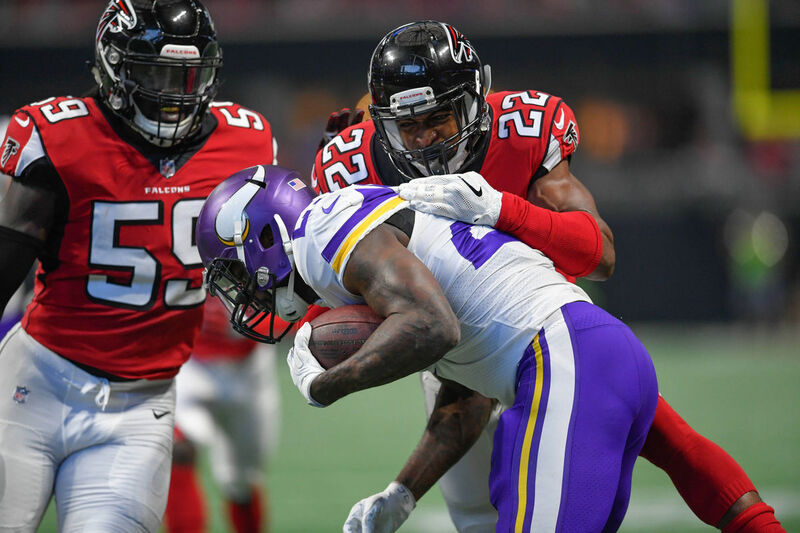 For those of you that follow the work of IDP guru Gary VanDyke (@HBogart27) here at CleatGeeks and elsewhere, he is a huge advocate for Deion Jones as the top dynasty linebacker going forward. Due to the variability of IDP scoring settings, top scorers can vary, so I won’t list the next tier, but try to find a second linebacker that gets a high volume of tackles so that he has a consistent floor that you can count on. I chose to make IDP a priority and fortunately own two of the top 10 players, so I am not concerned here heading into 2018. 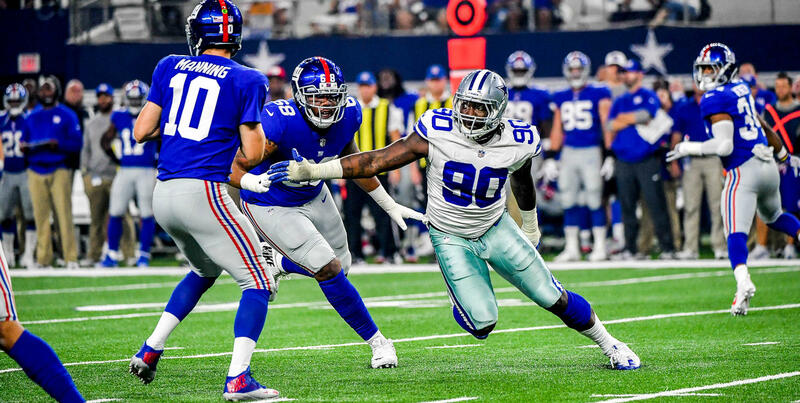 To fully take over a middle linebacker role as captain of the defense may take a few years, but when it happens, these players don’t lose that spot very easily. Jarrad Davis (DET) will look to progress even further in 2018 after a strong rookie year. Roquan Smith (Georgia) and Tremaine Edmunds (Virginia Tech) will both likely be drafted in the first round and could be difference makers early in their careers. For the defensive back position, the majority of the top scorers are safeties that frequently play closer to the line of scrimmage and help in run support. Defensive back fantasy production can vary quite a bit by game script, for example if these safeties are forced to drop into coverage and play conservatively rather than aggressively blitzing off the edge. Even if you see familiar faces, there will almost certainly be new members of the top 10 each year. In 2017, the top 10 in my league were Reshad Jones (MIA), Adoree’ Jackson (TEN), Keanu Neal (ATL), Jordan Poyer (BUF), Kevin Byard (TEN), Landon Collins (NYG), Desmond King (LAC), Sean Davis (PIT), Devin McCourty (NE), and Glover Quin (DET). You don’t want to reach too much for IDP in drafts, but I would still recommend grabbing a top guy before they are all gone. NOTE: My league gives points for return yards, which helped Adoree’ Jackson make it into this group. Due to the variability of IDP scoring settings, top scorers can vary, so I won’t list the next tier, but try to find a second defensive back that is also a safety that gets a high volume of tackles for the position rather than relying on interceptions or defensive touchdowns. To plug Gary VanDyke again, his article here highlights teams using sub-packages with three safeties that may lower IDP opportunities relative to teams that do not employ this formation. I chose to make IDP a priority and fortunately own two of the top 10 players, so I am not concerned here heading into 2018. Defensive backs entering the NFL these days are versatile and have the ability to play cornerback, safety, and linebacker. Players like Jabrill Peppers (CLE), who was not used properly last year, may be able to break out in 2018 if their teams take advantage of their strengths in all three phases. Minkah Fitzpatrick (Alabama) and Derwin James (Florida State) are both in the conversation to be taken in the first 10 picks of 2018 and could provide a versatile defensive weapon for their new team and yours. Thank you for reading my takes on how to structure your team at each position. Hope it can help you find success! Find me on Twitter @brad_petrowitz and feel free to send questions or thoughts my way! I'm a sports fanatic and an amateur writer here at Cleat Geeks. My passion lies in fantasy football, particularly dynasty and IDP leagues. Lifelong Packers fan despite being born and raised in Michigan. Secondary team is the Arizona Cardinals. Follow me on Twitter @brad_petrowitz and send any questions, comments, thoughts, or article ideas you may have my way and I'll connect with you!